I’ve long been a fan of contrasting combinations — ripped jeans with ladylike pumps, a girly dress with chunky boots, a unique hairdo with a buttoned up pantsuit. Not that I can pull off the latter — after some serious deliberation this past summer, I decided that an undercut à la Alice Dellal or Natalie Dormer was juuuust pushing it a bit (ya think?). But what I’ve always loved is repurposing my dress as tops and pairing them with shorts or pants. It not only extends the wearability of any one piece, it’s a more wearable version of the intellectual fashion of the ’90s dominated by the likes of avant garde Belgian designers Ann Demeulemeester and Dries van Noten. It also happens to be a favorite look of über blogger (and my style hero) Margaret Zhang. 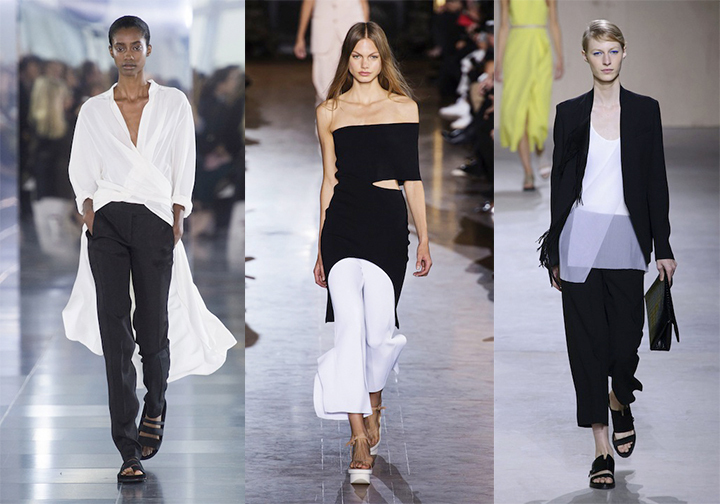 From left: Amanda Wakeley, Stella McCartney, Boss Hugo Boss. For my dress over pants look, I found this high-low hem dress (dress? top?) at Zara in a gorgeous pale grey that verges on periwinkle, depending on the light. The material is light enough that the “tail” will flutter nicely in the breeze, and there’s enough material in the front to tuck in just so. 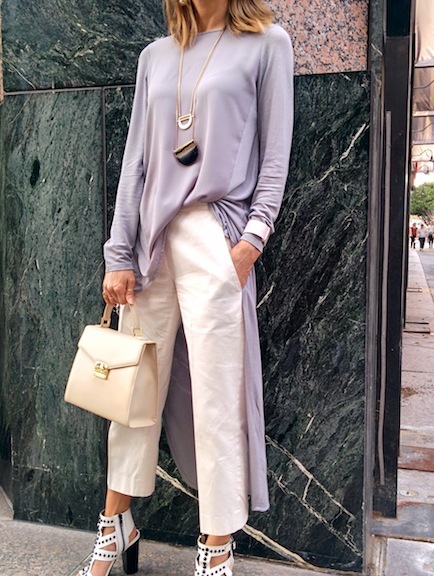 I paired it with my Miu Miu pant that I bought in the ’90s during an August shopping spree in Singapore — these pants had been hibernating for quite some time, and I pulled them out recently, what with all the cropped pants showing up on the runways. Another oldie but goodie from my closet (see? That’s one benefit of being over 40 — you accumulate a lot of stuff that inevitably will come back to the forefront of fashion) is my ladylike top-handle Mark Cross bag. A fine leather goods line, Mark Cross started in the 1800s as a purveyor of carriage saddles and harnesses. It had its heyday in the ’90s with its Grace Box bag and has been making a comeback in recent years. The look is finished with my Steve Madden tribal-look heels that I wore to death all summer, and layered necklaces with a touch of black to pick up on the black studs on the heels. Wanna try out the look for yourself? Shop some high-low tops here.